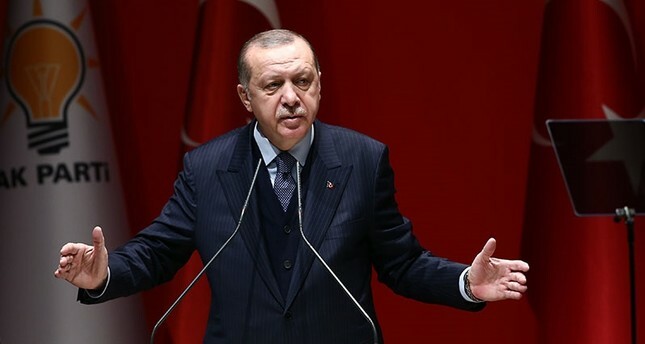 President Recep Tayyip Erdoğan slammed Friday recent comments by a spokesperson of the U.S. Department of Defense claiming there were civilian casualties in Turkey's Operation Olive Branch to clear the PKK-affiliated People's Protection Units (YPG) in Syria's northwestern Afrin region. Addressing the ruling Justice and Development Party's (AK Party) provincial chairs in Ankara, Erdoğan said that what upsets Turkey the most is the hypocrisy and levity displayed by some countries that Turkey regards as its allies and has deep political and military relations with. "Yesterday, the defense department spokesperson of one of these countries, unashamedly, without flushing, said that civilians die in Afrin, people could not return to their homes due to violence. You are heartless, immoral, you feel no discomfort about the murder of hundreds of children, women and elders in eastern Ghouta every day, yet you are troubled by the fight against terrorists and spread false news," Erdoğan said. Erdoğan was referring to the statements of Pentagon Spokesperson Adrian Galloway on Feb. 21, who said that the U.S. is concerned about the effects of the operation on the civilian population, and U.S. authorities will do their best in their contacts with their Turkish counterparts to reduce tensions and harm to civilians. In his speech, Erdoğan said 415 square kilometers (160 square miles) of territory was now under control and 1,873 terrorists had been neutralized. "The operation will continue with a new strategy once Afrin's city center is surrounded, which will soon happen, and the terrorists are cut off from outside contact," Erdoğan said. He added that Turkey expected the next phase of the ongoing Afrin operation to proceed faster since the strategic hills in the region were now largely cleared of terrorists. "Our heroic soldiers are fighting selflessly and courageously, moving toward Afrin step by step by destroying the fortifications the separatist terrorist organization has carefully built for attacks against Turkey," Erdoğan said. Erdoğan added, "We will first clear Manbij from terrorists, and then will continue until we make all of the west of the Euphrates safe for us and our Syrian brothers." According to the Turkish General Staff, the operation aims to establish security and stability along Turkey's borders and the region as well as to protect Syrians from terrorist oppression and cruelty.